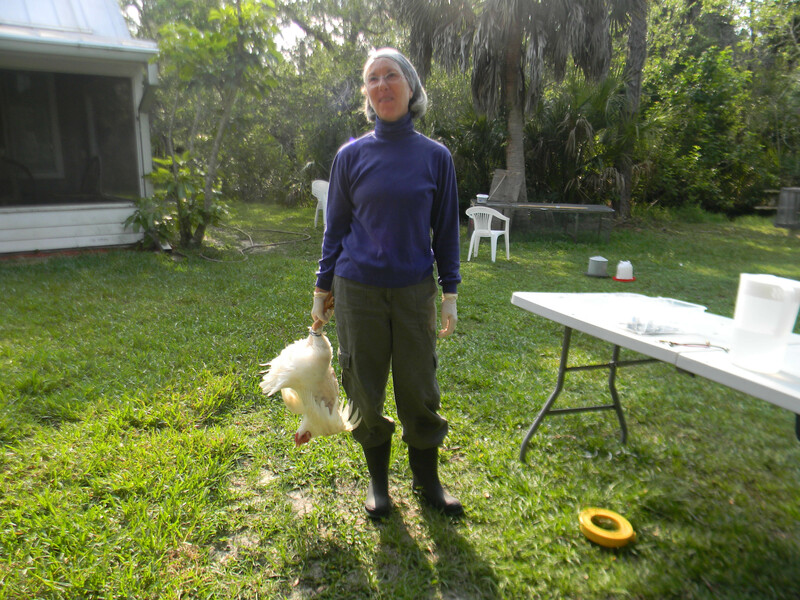 WARNING: If catching a live chicken and butchering it is not your thing you may not want to read the rest of this post. Today I took my class on butchering a chicken. A friend of mine (Jean) told me about a small family farm that was giving classes. I am always up for a new challenge (except when it comes to breaking bones in my own body) so I said why not. I emailed the owner (as it turns out I had met her through a mutual homeschooling mom) and told her I would like to take her class. After I scheduled my class I began to rethink if I could really do this, kill and butcher a chicken??? I watched a few videos on Youtube so I could kind of figure out what I had gotten myself into. I even wondered if after I did this that I could ever eat chicken again. I began to pray and just gave it all to Yehoshua and asked Him to give me a peace. I also prayed that He would somehow use this in my life and the life of others. Why do this in the first place? For myself I had several reasons. First I think that we are so removed from our food sources. Just about 100 years ago no one would have given this idea a second thought. Another reason is that the way animals are raised for food production in most factories and farms today. Here is a video that shows just one chicken facility. Another great video to watch is Food Inc. which can be purchased or watched on Netflix. Jean decided to go again so we rode together. When we arrived I was not sure what to expect. We were greeted by a beautiful border collie that immediately began guarding us from the squirrels. 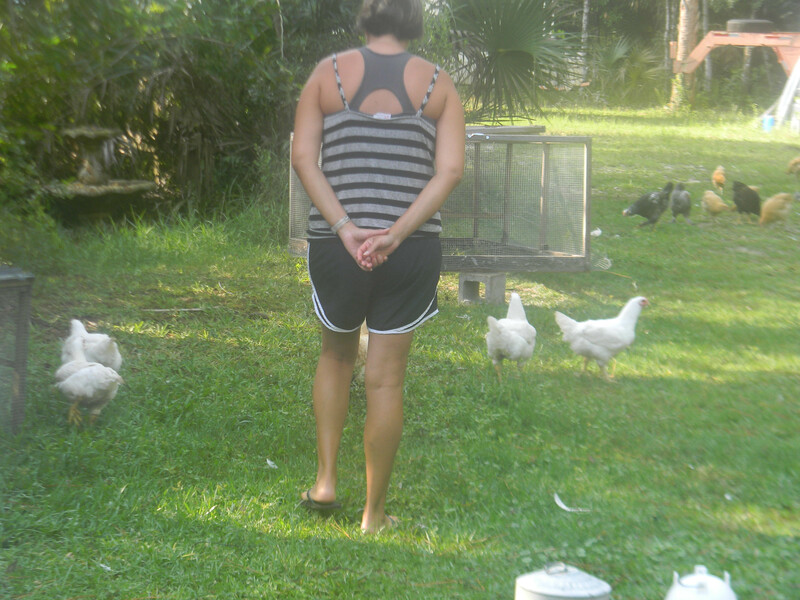 Marcie told us which chickens we would be catching and about the other chickens she has for egg laying. She has quite a variety. The chickens for meat were Cornish and 3 months old. Marcie began our session with prayer. What a wonderful way to start! There were 3 of us butchering today. 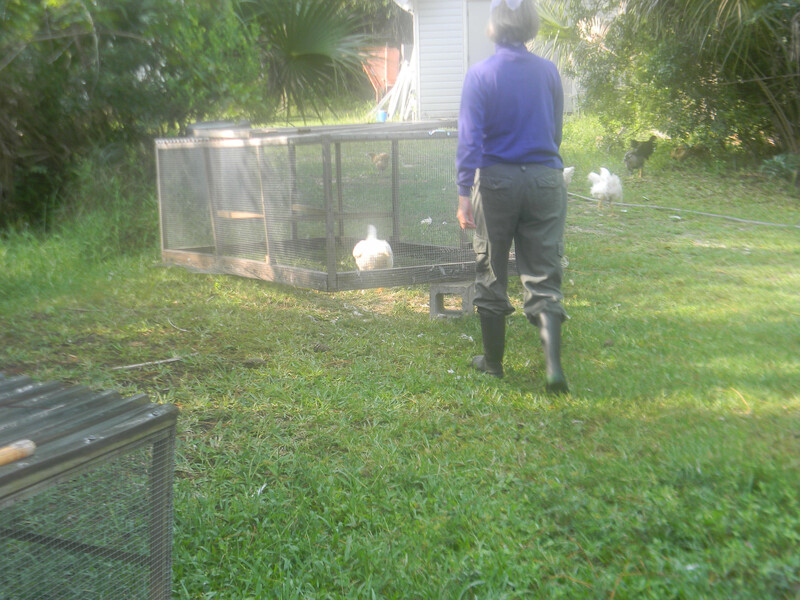 Our first job was to catch the chickens. That was a job in itself. I was trying to take pictures of the other two catching their chickens so I was not in a hurry to catch mine. When it was my turn the two last chickens had gone into their coup (see middle picture below). I couldn’t lift it but it was propped up by a cement block. I thought if I was only taller I could just get hop over the coup and I could corner them. I decided to step up onto the block and I was just tall enough to get my leg over the coup and onto the block on the other side. I was able to get the a chicken by the legs and get back over the coup. Not bad for someone who is 4’11” and 53 years old. It was then time to kill the chicken. To kill the chickens in the most humane way you hang them by their feet and cut the carotid artery. The owner had killing cones which I had not seen in any of the videos I had watched. This helps the chicken from flailing all over the place. After they had bleed out we then hung them on a line and washed them off. Then into a pot of water for a swish. If I remember correctly the temperature needs to be around 154 degrees F. This helps the feathers come off nice and easy. Then back onto the line to pluck. There are some fancy plucker machines out there but from what I saw they are around $600. 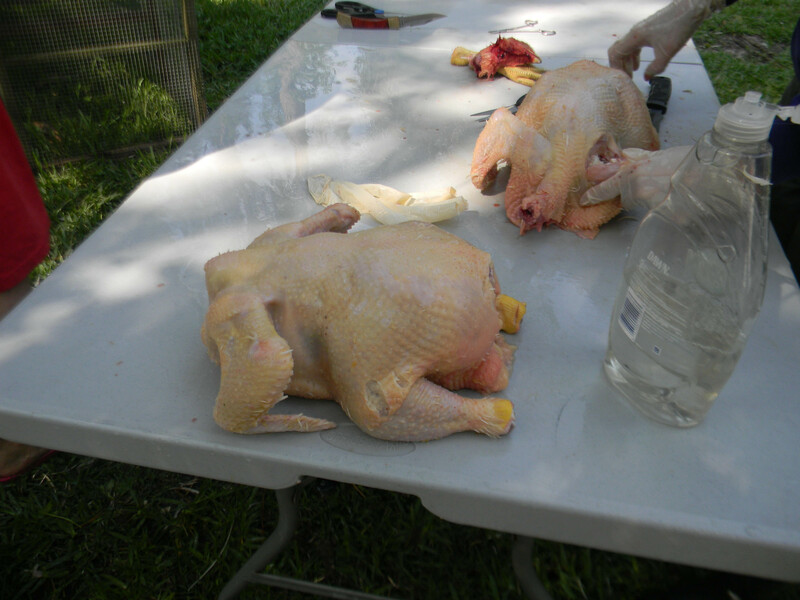 After plucking we washed them again and went to a table to begin butchering. We first cut the feet and head off. Then it was on to the more tedious steps. Here is a great video on how to do this part. Marcie was great in explaining what all the organs were. Here is a picture of the internal anatomy of a chicken. Jean cut her chicken in to pieces and I left mine whole. 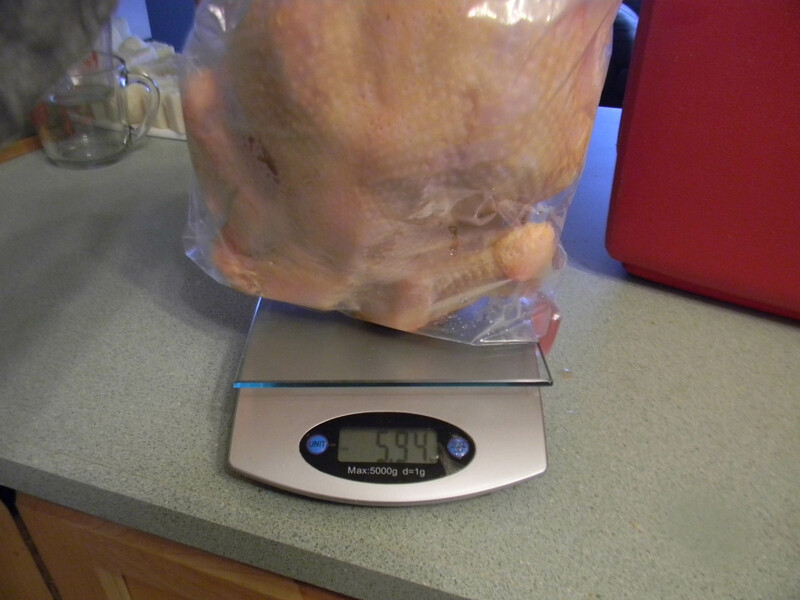 My chicken ended up being almost 6lbs and I only paid $12 for it. This is a lot less than a store bought organic chicken. I can’t wait to cook this and taste the difference between a free range/organic chicken and a store bought one. This entry was posted in Food, Posts and tagged butchering a chicken, chickens, organic chickens. Bookmark the permalink. I am always so blessed by Marcie’s willingness to share her wealth of knowledge with the rest of us. I know that my kids and I have benefitted greatly from her service to others. Glad you were able to go through with the butchering. Keo, I had a wonderful time with you, Jean and Marcie yesterday. Thank you for the pictures. I look forward to possibly butchering again with ya’ll. Hope you like the Thai Soup.